As a florist, I often get asked asked what my favourite season is, along with my favourite flower, both are equally tricky to answer for lots of reasons. Firstly, the seasons. This has been the source of many a joke between my husband and I for several years now. As a nature lover and keen walker, we’ve walked many miles together through some beautiful countryside and stunning scenery and I always comment on the changing season, with ‘I love Autumn, it’s my favourite season’, ‘I love Winter, it’s my favourite season’…………you know where I’m going with this right?! So much so, now we just laugh, or give a knowing smile to one another as he knows what’s coming. 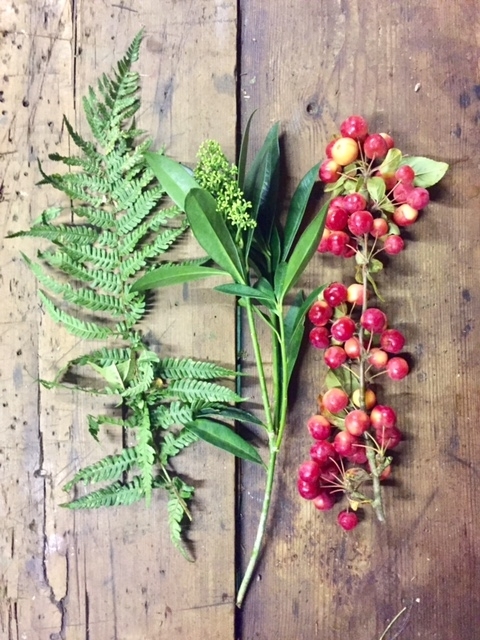 Fern, skimmia and crab apples. My point being, I love them all for different reasons, and each change brings an invigoration to the spirit for the few weeks ahead. I am pretty sure that the seasons are why I love this country so much, I’d get very bored living within a constant. However, we are now in Autumn and I’m embracing all that it has to offer. As a florist it brings a beautiful warmth to the design palette, a diversity of textures and material form and a sumptuous variety of flowers, fruits and foliage to play with. The countryside provides such inspiration for designs and is a constant influence to me. Crocosmia, snowberries, birch and poppy seed heads. I love going out into the local countryside with Bronte the dog on a beautiful Autumnal day to see the beauty that is displayed all around me. The hedgerows that are packed full of blackberries, crab apples, rose hips, elder berries and hawthorn. The deep and rich colour palette never ceases to stop me in my tracks. The beautiful changing light provides the perfect spotlight to showcase the wonderful colours all around me, I just love it. On many a walk I arrive back home with twigs, berries, apples, conkers and foliages. Each time they surprise me and prove irresistible with their beauty. Sometimes I just have a play with them within designs, or simply take photographs for inspiration. It’s a love that is shared and enjoyed by all in my household and I often pick the children up from school and empty their pockets which are packed full of acorns, conkers, sticks and leaves! Get out in the fresh air, take a walk in the countryside and admire all that Autumn has to offer. Aside from the excitement of Halloween and the terrific fireworks displays on Bonfire night, every day the Autumn countryside has plenty of fire crackers to see and appreciate, we just need to open our eyes. 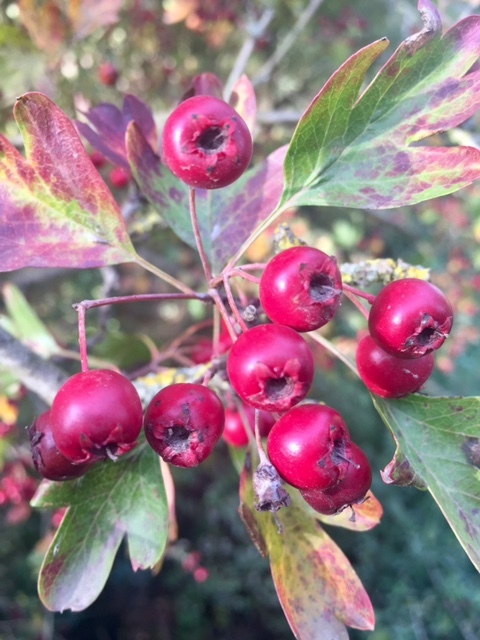 Blustery days, changing colours, first frosts, fruits, berries, conkers, acorns, twigs and the birds stocking up on all that is on offer, I love Autumn, it’s such an inspiration, my ‘favourite’ season! An act of love and kindness, we could all benefit from a little of this. That’s the beauty of Lily’s Lost bouquet. Yesterday we left the first ‘lost bouquet’ on a bench in Abbey Fields in Kenilworth. The idea of the lost bouquet is to leave it somewhere in Kenilworth every month for someone to find. Each bouquet will be left with instructions for the person who finds it to take it home and love it! They can either keep the beautiful bouquet or give it to someone who they think would really benefit from it. We want people to feel special and think of others and we love flowers and the way they make people feel. Each month we will be posting about the lost bouquet and we can’t wait to read about all the stories and where they find their new home. Yesterday a young woman and her boyfriend were walking through Abbey Fields and found the ‘lost bouquet’ sat on the bench, they read the instructions, took the bouquet and delivered it to a friend that was in need of cheering up. This is wonderful, it’s exactly how we intended. The power of flowers, the power of a kind act……what small gesture will you do today to make an impact on someone’s day? A note to the person who found the lost bouquet.